Medicaid Expansion will be among the first to hit the chopping block, leaving the states to pick up the tab. However, even without inevitable problems at the federal level, Medicaid Expansion still costs us money. That is why other states are struggling to pay for it, and trying to raise taxes. What tax would proponents like to raise here in Wyoming, in order to pay for Medicaid Expansion? It's that time of the month again... the time when the Expansionist chorus once again sings the praise of putting more Wyomingites on Medicaid. This time, they won't take facts for an answer, but I will provide them anyway. This is too important an issue to leave to creative reasoning. Voters in three conservative states, Nebraska, Idaho and Utah, passed citizen initiatives to expand Medicaid coverage in last year’s midterm elections. In a fourth state, Montana voters rejected an expansion initiative because it was connected to a tobacco tax increase. Before we move on, let me set the record straight regarding Montana. Barron gives the impression that Montana has rejected to accept Medicaid Expansion. That is not the case. Montana accepted Medicaid Expansion in 2016. The vote this past November was about extending Expansion beyond 2019. Since that extension would have relied on paying for Expansion with a tobacco tax, voters said no, preferring to terminate Expansion. In other words, Medicaid Expansion has not been a good enough experience for our northernly neighbors. The Montana experience should be a lesson if Wyoming Medicaid expansion proponents plan to get a similar initiative on the state’s general election slate. Given the Wyoming Legislature’s solid rejection of any and all Medicaid expansion bills in recent years, the citizen’s initiative appears to be the only avenue remaining to extend coverage to an estimated 20,000 low income residents who now have no health insurance. Here Barron gives the impression that Medicaid Expansion is going to reduce the number of uninsured Wyomingites to zero. That is, of course, not the case. In a little bit we will review data on health-insurance coverage that shows the truth about the relationship between Medicaid and the uninsured population. The Fairness Project ... lists Wyoming among the states where Medicaid expansion initiatives could get on the ballot in 2020. The other states are Florida, Mississippi, Missouri, Oklahoma and South Dakota. The Fairness Project is evaluating the viability of campaigns in all six states, the project’s press secretary, Colin Diersing, said in an e-mail last week. Meanwhile, if you’re a gambler, you can safely bet the farm or the family bungalow that the Wyoming Legislature will remain firmly entrenched against extending any parts of Medicaid coverage to the uninsured working poor. Again: Medicaid Expansion is not the only path to health insurance for the uninsured. It is, in fact, the worst path, one reason being that the federal government does not at all cover 90 percent of the cost of Expansion enrollment. That's right. The number you so often hear is in fact incorrect. Medicaid Expansion offers federal coverage to 90 percent of the enrollment that is expected when a state decides to adopt Medicaid Expansion. If actual enrollment exceeds that number, the state picks up 100 percent of the cost for that excess enrollment. For this reason, Medicaid Expansion has turned out to be far more expensive than we were led to believe six years ago, when the Obama administration was flying to state capitals trying to sell Medicaid Expansion like a cadre of snake-oil salesmen. However, the "unexpected" extra cost to states is not the only fiscal problem with Medicaid Expansion. The federal funds that actually go into the program are no longer as reliable as they once were. States are rightly beginning to doubt whether or not Congress will be there for them - even with the funds that were promised to go with Expansion. National political analysts say they expect the movement of states toward expansion will taper off because of uncertainty over the future guarantee of federal money in the Trump administration. That distrust of the federal government has played a large role in the multiple rejections of expansion by the Wyoming Legislature. Barron also expresses surprise at the fact that there is big support for Medicaid Expansion among the medical community. She finds "nearly unprecedented vigorous support by the entire medical community —doctors, nurses, hospitals, various health care groups". I doubt that the support is as strong as she says; we know that the Wyoming Medical Society is in favor of Expansion, but that does not mean all, or even a majority, of their members are for it. The usual argument for Expansion is that health care providers will be compensated for hitherto uncompensated care. That compensation will, of course, be at Medicaid rates, which many providers say is below cost. So on to the citizens initiative ballot. Montana’s unfortunate initiative plan offers a lesson on what not to do. First, do not attach it to a tax on an organization like Big Tobacco with its deep pockets. The supporters threw in the tax increase as a tactic to mollify critics who fretted that if the feds reneged on their Medicaid support guarantee, the citizens would have to make up the difference. The tax revenue, the supporters argued, would pay for any shortfall in federal money that developed. The tobacco companies declared war against the ballot initiative and unleashed a media campaign to kill it. The companies raised nearly $19 million and spent $17.2 million, mostly on a TV advertising blitz, according to Stateline.com. Supporters of the initiative, with only $9.7 million, couldn’t compete. Of course. Because the rednecks in Montana are not Coastal dwellers with sophistication enough to make up their own minds. Obviously. Listen to what Barron is saying. She is advising Expansionists in Wyoming - and that out-of-state organization she refers to - on how to get Expansion passed here. If there is going to be a tax somewhere to pay for Medicaid Expansion, she suggests that it should burden people who do not have the resources to fight that tax hike in the public-opinion arena. She actually wants the proponents of a tax hike to be so much more powerful than those who will pay the tax, that there is no chance for the targeted population to voice any meaningful opposition. Who are those people? Not the rich, because they have a lot of money. Not businesses - Barron just said that businesses will throw millions of dollars into the campaign and win. So, who's left? People who live paycheck to paycheck. People who cannot afford anything near the millions that pro-Expansion campaigners will spend to impose that new tax. Now, let us take a look at some data regarding Medicaid Expansion. To see what difference Expansion has made, we review health-insurance coverage data from 2013 and 2017. In that interval, a total of 31 states passed Medicaid Expansion, with 26 of them already in 2014. 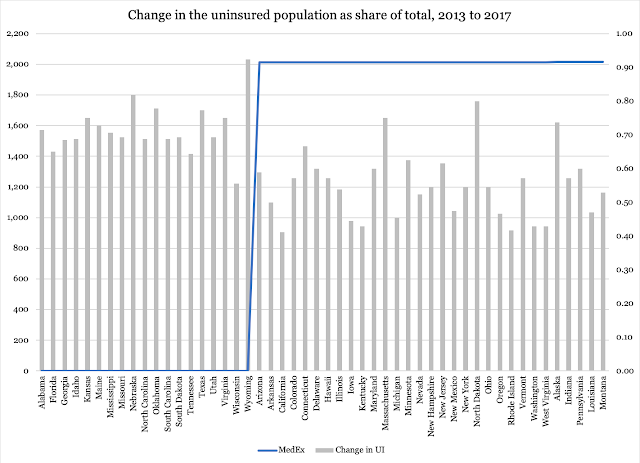 If Expansion was the outstanding success that its proponents suggest, we should therefore see a major difference in the trend of the uninsured population, such that it declined in states that passed Expansion - and increased, or at least remained steady, in states that did not pass expansion. But wait - what about the states to the left, "above" the blue line? Did not the uninsured population shrink there as well? Yes, indeed it did. In fact, as share of total population, the uninsured fell by 4.2 percentage points in the 19 non-Expansion states. In the 31 Expansion states the same number was 5.9 percent. Aha, says the Expansion proponent! Evidence that Medicaid Expansion works! 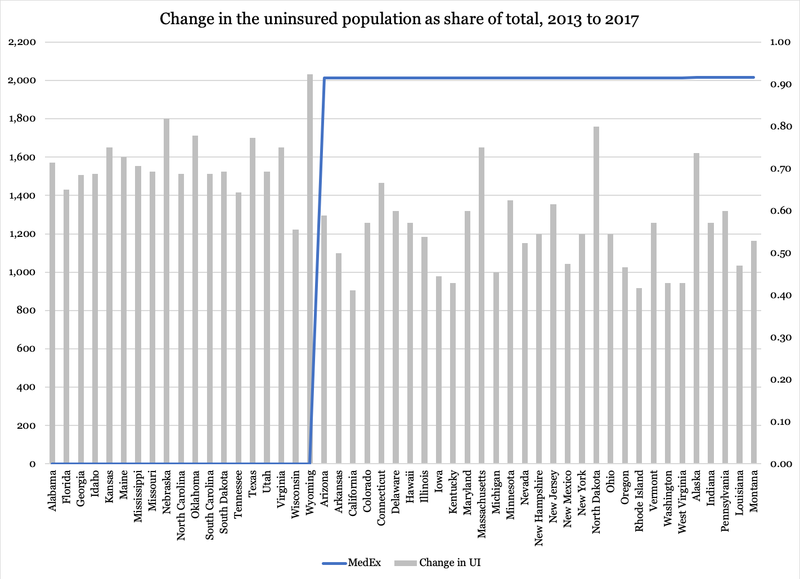 The reduction in the uninsured population was bigger in Expansion states. Yes, that's true. However, the dirty little secret is that almost all of that reduction happened because of Medicaid. This is almost a tautological point in and by itself, but what the Expansionists won't tell you is, first, that the uninsured population declined in non-Expansion states - and, secondly, that its decline was due overwhelmingly to growth in private insurance. Private insurance expanded by 4.6 million. Private insurance and Medicaid thus grew their enrollment by 1.5 million people more than the uninsured population declined. This is attributable to population increase, and transfer between these two programs and other types of insurance (Medicare, other government insurance). The bottom line, though, is that Medicaid grew twice as much as private insurance in states that accepted Expansion. Private insurance expanded by more than 6.9 million. Here we see an increase in Medicaid and Private insurance coverage that is 68 percent higher than the decline in the uninsured population. It is very likely that this is predominantly due to population increase in those states (Texas and Florida among them). Furthermore, the increase in private insurance coverage is big enough to account for the entire decline in the uninsured population. Bluntly: if we, here in Wyoming, do not pass Medicaid Expansion but instead facilitate for families and businesses to obtain and provide private health insurance, we can be just as successful in reducing the uninsured population as if we put more people on tax-funded Medicaid. One of the many upsides of this is that we do not have to raise taxes. How about that?